After discovering an imprisoned hagraven, you must help her reclaim her lost tower. Find Melka imprisoned in Blind Cliff Cave. Protect her from Forsworn as you travel through the tower. Upon entering Blind Cliff Bastion you will see the hagraven Melka in a cage. 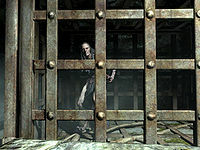 Upon approaching her, she will ask you to free her and help her reclaim her tower from another hagraven, Petra. To release Melka, pull the chain near the cage. After leaving the cage she will then lead you through her tower. The first room displays a central stone slab adorned with three handles; Melka will tell you that the middle one is the correct one to use. Pull the handle and go through the gate it opens. Follow the short path into a room inhabited by a Forsworn. There will then be a gate with a tunnel full of swinging blades. Melka will mention a lever that will stop the blades: she will then pull a handle on the floor that lowers a section of a wall, revealing another lever to do just that. Move through the tunnel and go up the stairs. After the stairs you will pass a section of wall that moves away when the nearby handle is pulled. Through the newly cleared section of wall are some ingots and a chest. The next room has an alchemy lab, and is referred to by Melka as her "parlor". Follow the path past the quicksilver ore. The next room contains Petra and two Forsworn. Killing them and Petra will result in Melka rewarding you with the unique staff, Eye of Melka. If Melka died anywhere along the way you can simply loot the staff from her corpse. You can also just kill Melka for the staff, but you will still have the objective to kill Petra and you will have lost your guide. If you kill Petra before freeing Melka, the quest does not complete and remains in your list of quests. Mod Notes: Quest stage 100 of the quest calls AchievementsQuest.IncSideQuests(), even though the quest Type is "Miscellaneous" instead of "Side Quests"
200 The Hagraven Melka is dead. The following empty quest stages were omitted from the table: 10, 11, 30, 40, 45, 50, 60, 256. On the PC, it is possible to use the console to advance through the quest by entering setstage dunBlindCliffQST stage, where stage is the number of the stage you wish to complete. It is not possible to un-complete (i.e. go back) quest stages, but it is possible to clear all stages of the quest using resetquest dunBlindCliffQST.